Raikou is the two-hundred-and-forty-third Pokemon on the National Pokedex and was introduced in Generation 2 (Gold, Silver, Crystal). 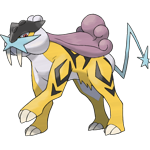 Raikou is an Electric type Pokemon. Raikou is a legenadry Pokemon. It is a basic Pokemon that does not evolve.